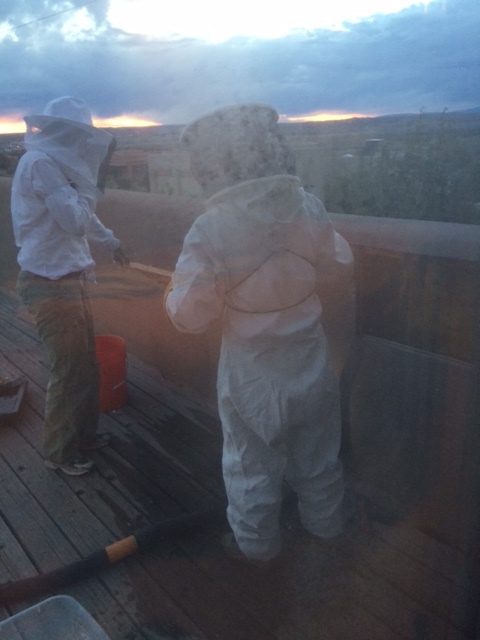 So this is what we beekeepers look like when we go out to visit our beeyards…and do cutouts. Some kind of outer space weirdos. This particular cut-out was on a piece of real estate in Placitas, New Mexico, atop a mesa, with a stunning view of the sunset. It was evening when I went in as a master beekeeper intern to assist Darren Jewel and his wife, including their adorable 7 year old daughter. They warmly welcomed me tagging along. They are veteran cutout artists who rarely lose a beehive cutout—whether a wall, an eave, a roof, or an airduct. Their expertise and gentleness in caring for the bees are, in my estimation, unprecedented. 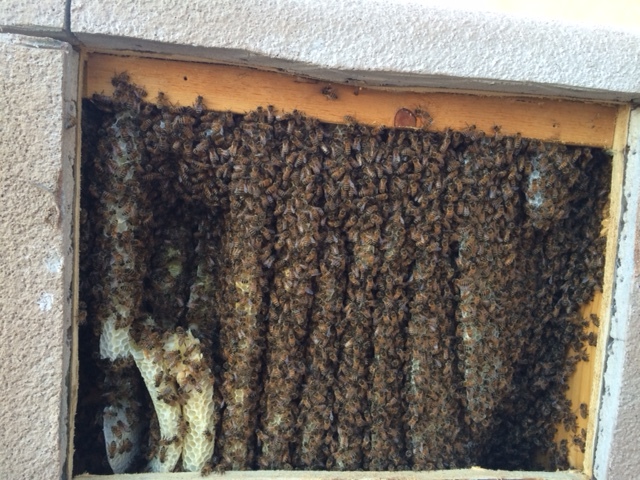 Our bee candidates had found a lovely, very hot home in the upstairs, external wall of a family’s second story roof patio. The family had been rather amenable to them staying until the bees began to become more active. As the hive grew and the summer heat cranked, the bees were clearly going to become even more visible. Let’s face it, the wall the bees chose was going to be hot as Hades in a New Mexican summer, Their combs would melt like butter. The bees didn’t yet know this when they had moved in during the warmish days of April. By the time we came to cut them out of the wall and dispatch them to a new home, they had filled up approximately a 3X3′ portion of the wall and made combs as long as Grandfather Time’s beard. Darren was as uncanny as a water diviner, as he tapped on the wall and listened carefully to determine whereabouts the hive might be located before sawing into the stucco to remove a portion of the wall. Once in there, one by one, we carefully cut off each long spike of comb, filled with bees and crammed with baby brood and honey/pollen. 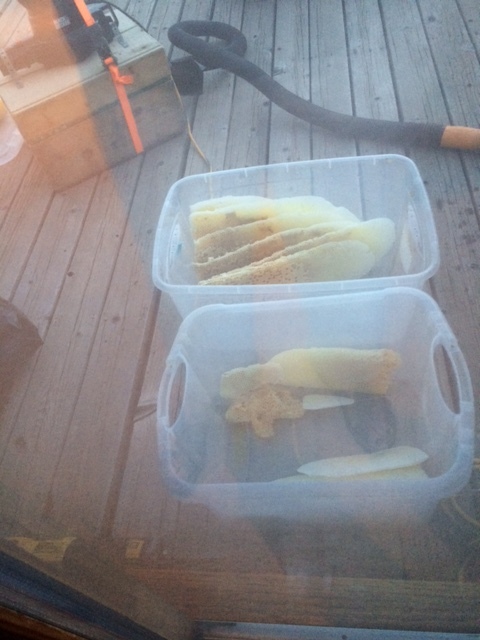 Darren’s wife meticulously vacuumed the bees off (see the wooden box below with the motor on top) and we carefully stored the fresh golden/white comb in plastic containers. 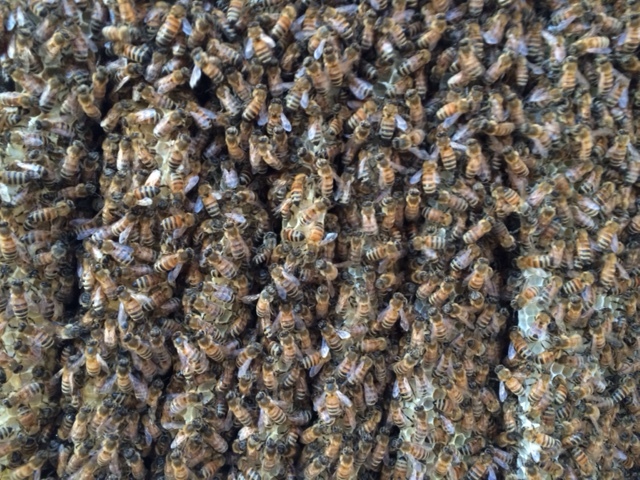 These would be banded to frames later and hung in a new hive. These days the temps are rocketing towards 100 degrees in the sun, almost everyday. This cut-out was a cake walk compared to many of the incredibly dirty, hard to reach, blazing hot cut-outs that the Jewel family often does—including cantankerous bees with Africanized genes. Though those are far and few between, according to Darren. I spoke with him this past week. He has 5 cut-outs queued up this week alone—alongside his regular job. The past weekend was a maze of cutouts—one lasting at least 7 or 8 hours, til past midnight. This year alone he has given away 30 beehive cut-outs alone, free of charge, to beekeepers in the area. I can tell Darren loves what he does. He never complains about the difficulties and he always shows deep respect and patience for the bees and humans in every situation—– even when he needs to “put down” a hive because it will be a hazard within city limits. This year alone there has only been one hive like that. For local beekeepers, this is good news. It means that the Africanized bee genetics have been held at bay and thus public opinion continues to be friendly towards pollinators. Darren’s unflinching goodwill, skill and high energy keep him ahead of the game. He is the one I would call if I ever had a bee cutout in my house. 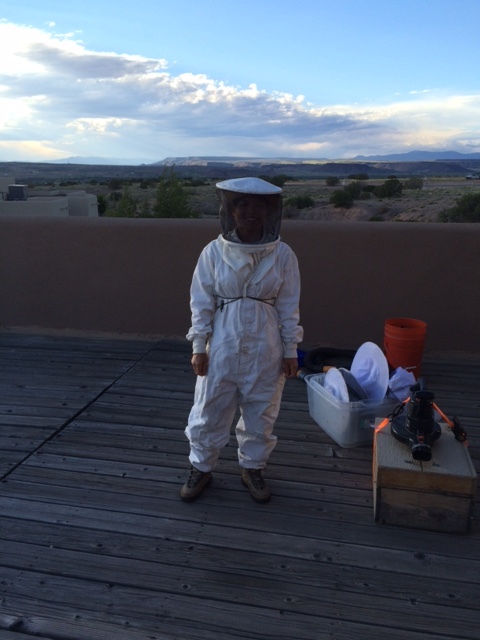 He still refers to the bees we took up in Placitas as my bees. “Want to know how your bees are doing?” he asked today when I spoke with him. “Yes!” I responded. Evidently those girls are happily re-hived at his aunt’s home and have rocketed to new heights of reproduction. That guy has some kind of magic with bees that I want to learn. Wow! So amazing. 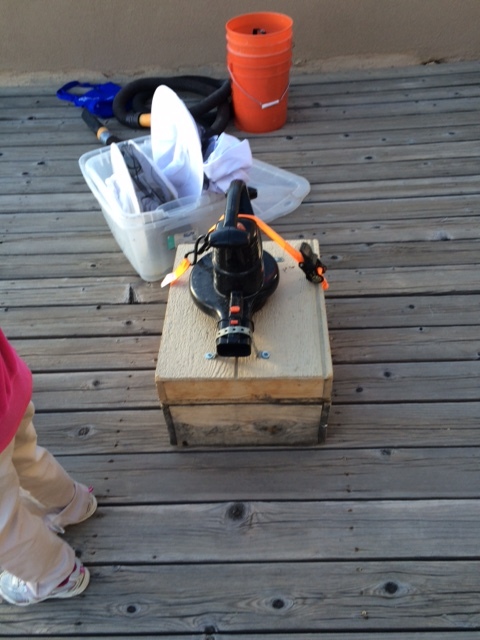 You are learning so much and becoming quite the apiary expert. Also, I think you are finding a new community in these keeper of bees. Thanks Anne. It’s a blast!